Our Quality Seal Dies really add an extra dimension to your print or packaging. Produced by using a combination of chemical etching and CNC machining, these dies make your product stand out from the crowd. They are, in effect, textured combination dies and can be produced to match your specification. The only limit is your imagination. We use the highest quality brass to keep the die crisp and sharp for longer. You have the choice of 0.3mm or 0.8mm counterforce backing to suit your press. 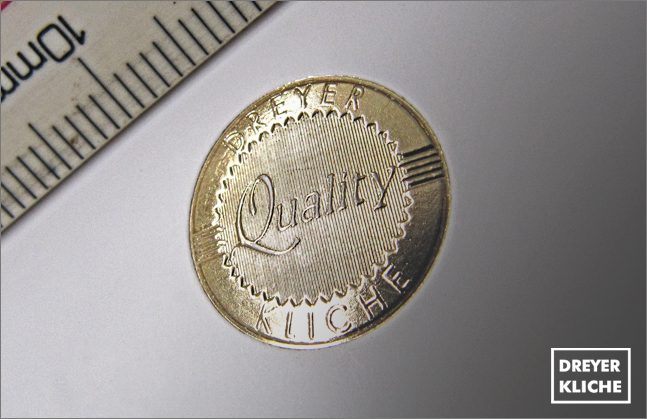 Quality Seal Dies are often used on High Quality letter-heads, packaging inserts and guarantee cards.